— Samuel & Marsha W., Another Happy Client! Ginny demonstrated genuine patience and respect. Her calm demeanor and understanding approach to problems and obstacles was awesome. We were obviously impressed and grateful for her work and expertise! Ginny is the best!!! She thinks outside the box to sell your home for the best price in the shortest amount of time. I would absolutely recommend her. Ginny was a pleasure to work with. There were no complaints when going through the process. I will be referring her to potential clients. Amazing experience. We couldn’t be happier! Ginny dropped everything to be with me when I called her to see a house. I gave her a very short time limit to find me a house, she was outstanding helped me find my dream house in 4 weeks. Miss Wandell was like a beacon of light to me when I was in a dark place. I was so frustrated with my lack of progress in my search for an apartment until my first consultation with Ginny. That’s when luck happened, after that everything changed for the better. She was my guiding light, my lucky charm. Thanks to Ginny now I have my dream apartment. Words can not describe how awesome you are Ginny. Thank you for everything. Ginny was a great asset to us during our house hunting journey. She was always easy to reach and quick to respond. Her friendly positive attitude kept us motivated even when the road was rough and winding. Ginny was professional at all times and kept our desires and needs first and foremost. She always respected our feelings and was patient with us. Ginny handled the negotiation process ethically and masterfully. She made sure our wants and needs were addressed. She made sure that communication between us and the seller was clear and fair. I would recommend Ginny to friends and family. She helped us find our dream home and although I don’t foresee us ever having to move again, I would use Ginny as our realtor if we did. My husband and I were very fortunate in finding Ginny through a contact. She went above and beyond our expectations as a realtor. She was very professional, and personable. Not only did she make herself available to answer any questions timely, but also went out of her way to join us through open house tours, giving us her honest feedback and guidance every step of the way. As new home buyers, we were unaware of how daunting the task of buying a house can be. She was well versed in all aspects of buying a home and was able to make other recommendations for different components; home insurance, lawyers, home inspectors, and research at the town halls, which made everything operate smoothly. We were very happy to have her in our corner and would strongly recommend her to anyone! My husband and I were very fortunate in finding Ginny. She went above and beyond our expectations as a realtor. She was very professional, and personable. Not only did she make herself available to answer any questions timely, but also went out of her way to join us through open house tours, giving us her honest feedback and guidance every step of the way. As new home buyers, we were unaware of how daunting the task of buying a house can be. She was well versed in all aspects of buying a home and was able to make other recommendations for different components; home insurance, lawyers, home inspectors, and research at the town halls, which made everything operate smoothly. We were very happy to have her in our corner and would strongly recommend her to anyone else. 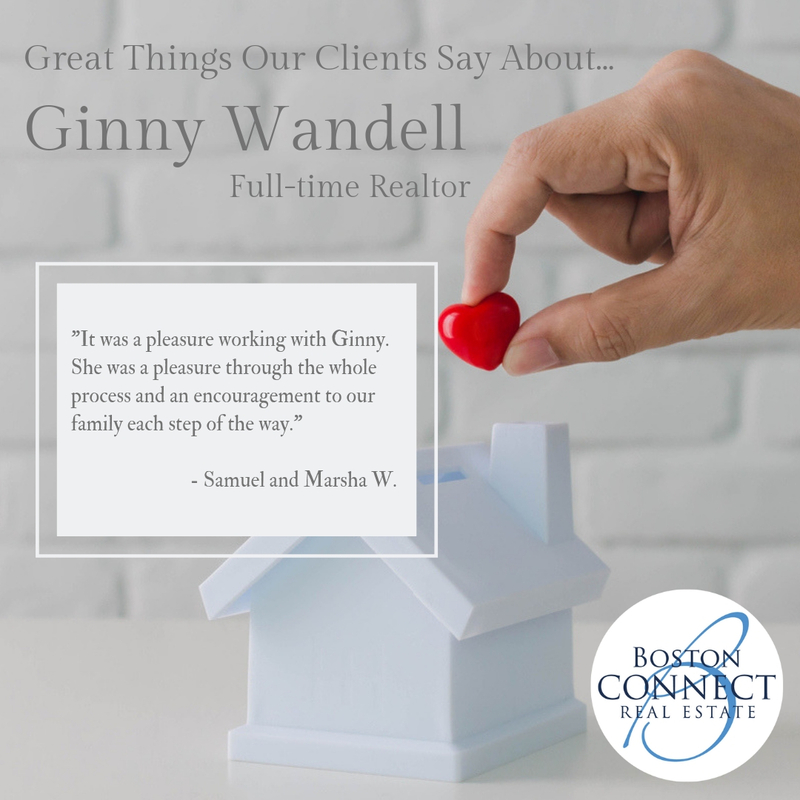 “We were fortunate to chance meet, talk, befriend and choose to work with Ginny Wandell of Boston Connect Real Estate Services in the selling of our home of thirty-seven years. Ginny’s interactions with diverse communities within, and her knowledge of Pembroke, we feel was a real plus. We got to know Ginny as a professional-friend, who was promptly responsive all of our inquiries throughout the entire process. 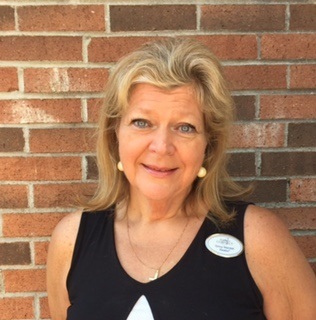 She was in constant communication and follow-up with us as to whatever short and long term actions were needed and what to expect for services even after closing.